Stow your tray table, put your seat back in the upright position , open the window blind and hold onto your nuts.....we invite you to join our 2 year (which has now turned into a 3 1/2 year) adventure in one of the most exciting cities in the world. Ho Chi Minh City/Saigon. Vietnam....look out! Here come the Moggys! 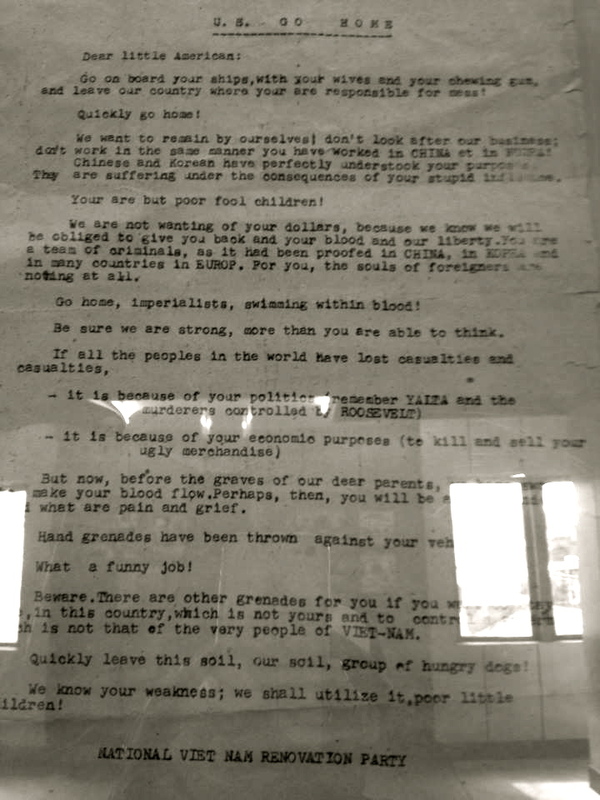 All content on this blog remain the property of moggysmekongmadness. Where photos are not taken by the author, all efforts to credit photographer have been made. Kindly refrain from reproducing or scrapping. With my shopping very much curtailed due to the fact that our belongings are on a boat somewhere between Vietnam and Australia and with payday not until Thursday, it was time to find some things to do around town that are easy on the hip pocket. Now there is not much easier on the hip pocket than free. 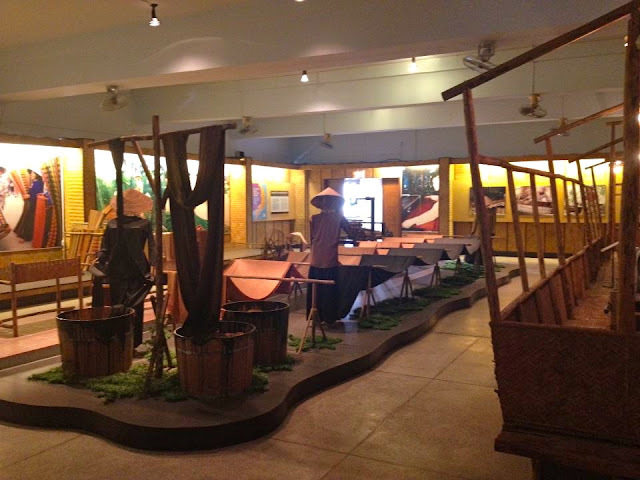 That is what it will cost to visit the Southern Women's Museum of Vietnam. 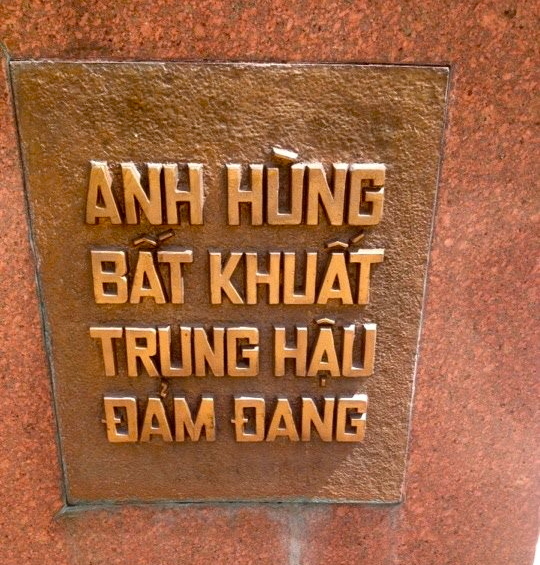 Located at 202 Vo Thi Sau, just head up Le Quy Don until you reach the end and you will see it across the road. Open early from 0730 but closes for lunch. When I arrived at 0900 there was no one there and the guy was running around for me turning all of the lights on! 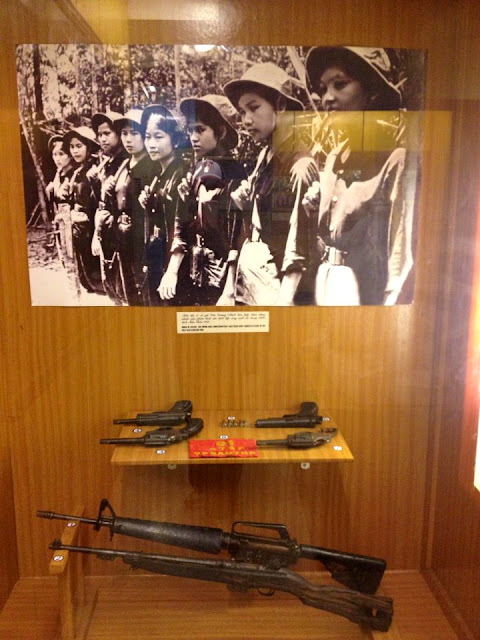 The museum is divided over 3 levels and the displays recount the role of southern Vietnamese women in both national construction and defense. 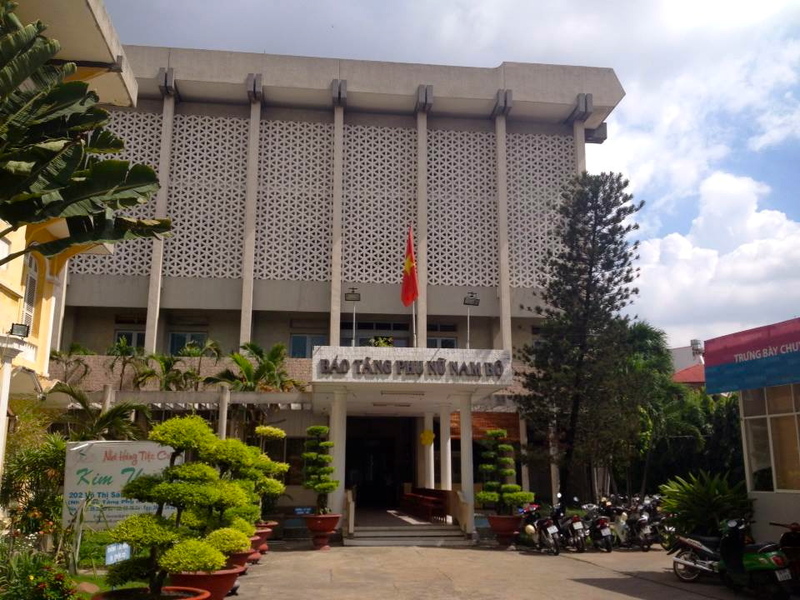 It opened in 1985 and sits on the former palace of the Police Force General in Saigon. I have been trying to find out who this lady is and for the life of me I can't figure it out. If anyone can enlighten me that would be great! 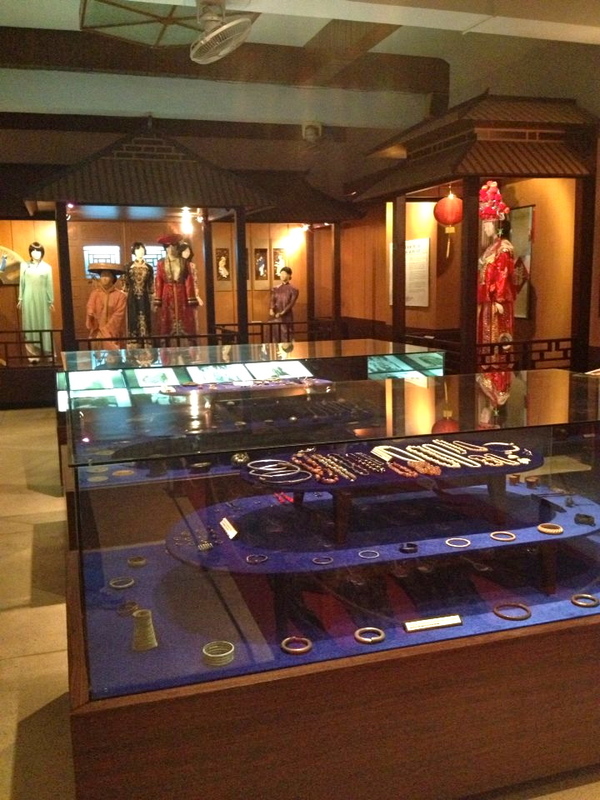 The first level holds a lovely display of costumes and jewelry through the ages. 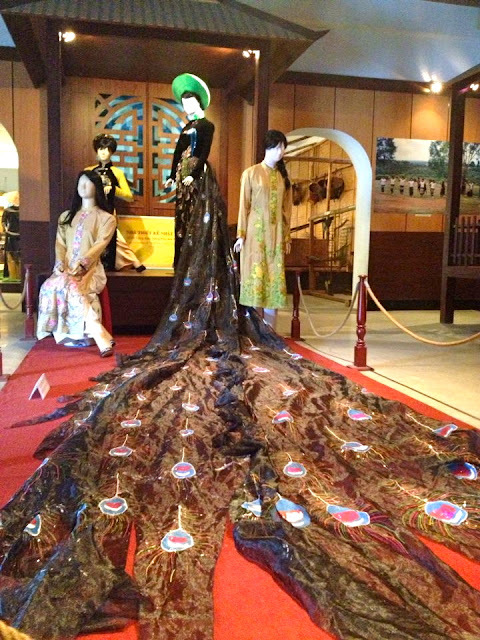 From the evolution of the Ao Dai to minority dress and jewelry its a fascinating peek. There was no air-conditioning but it was large and airy with plenty of fans. The whole museum itself is separated into about 10 rooms each focusing on a different aspects of women's contributions to the country. As you leave this room you will enter one that shows the skills of loom weaving and silk making/colouring. As you leave that room and head up to the next level the mood becomes much more sombre. The next 2 levels pretty much outline the large contribution that Southern Vietnamese women have made during the many conflicts and uprising over the years. There is no sugar coating however it it absolutely fascinating to read and see their impact. Most of the artifacts/letters/displays have brief english translations. The one above did not require one. The women of Vietnam were not the type to sit at home and stoke the fire whilst their husbands and sons fought. Oft times they were right there beside them. Whether that be in battle or in prison. 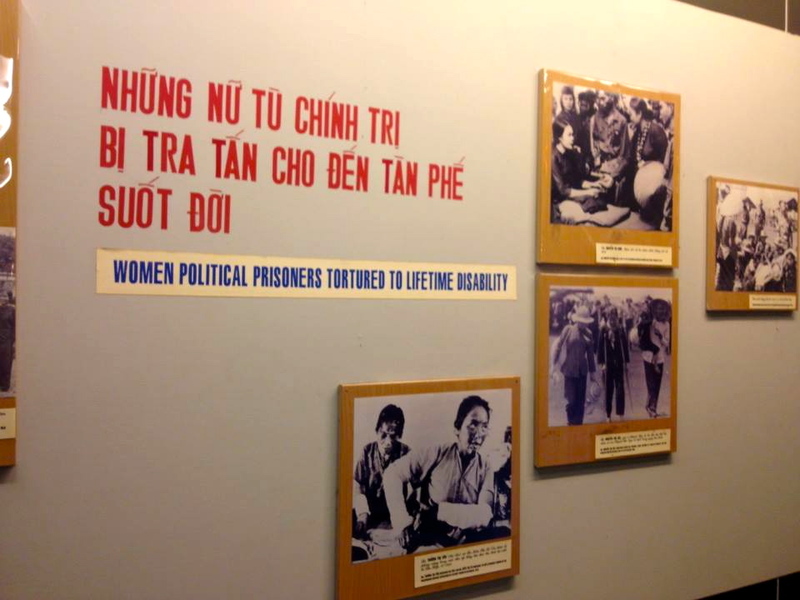 I was fascinated to read of the numerous Political female prisoners held in Con Dao Prison. No wonder no Vietnamese people want to go there for a holiday! This series of photos particularly touched me. 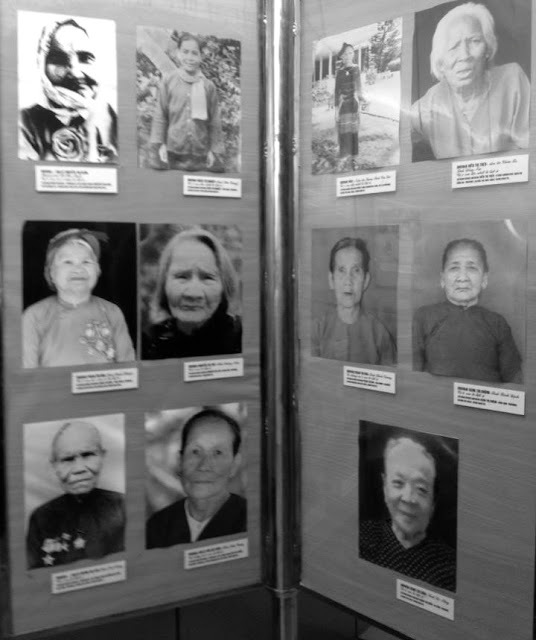 They call them the Heroic Mothers and they have all lost numerous family members, usually multiple sons, in conflicts. How do you lose 8 children and 2 grandchildren to war and keep going? This is Vo Thi Sau. 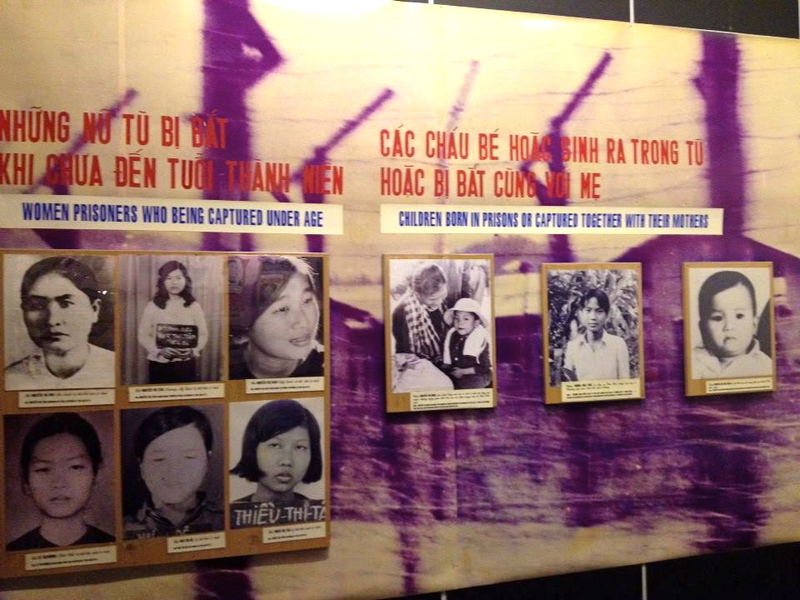 A schoolgirl guerilla and a Martyr in Vietnam. 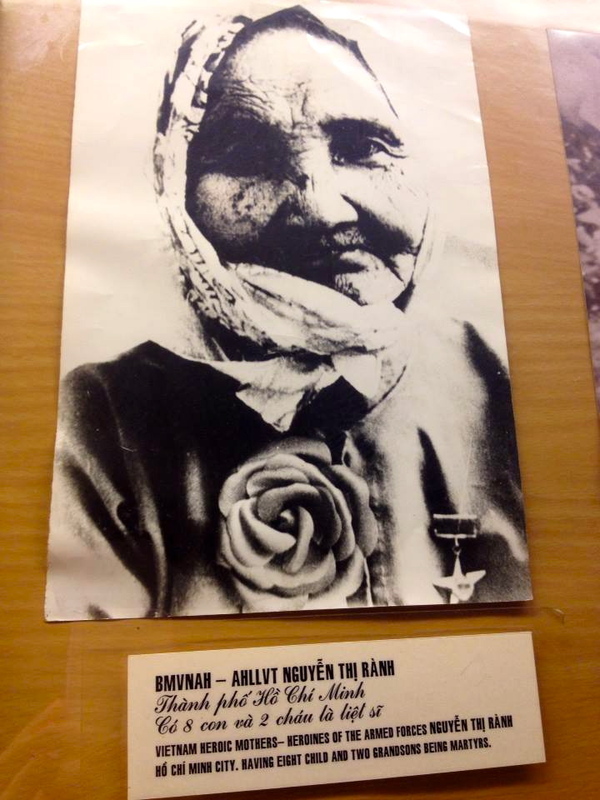 She became a contact for a local guerilla group after many of her friends and family joined the resistance against the French.When she was 14 she threw a grenade, killing a French soldier and wounding 12 others but escaped undetected. In 1949 she attempted to throw another grenade at a Vietnamese chief but was captured. 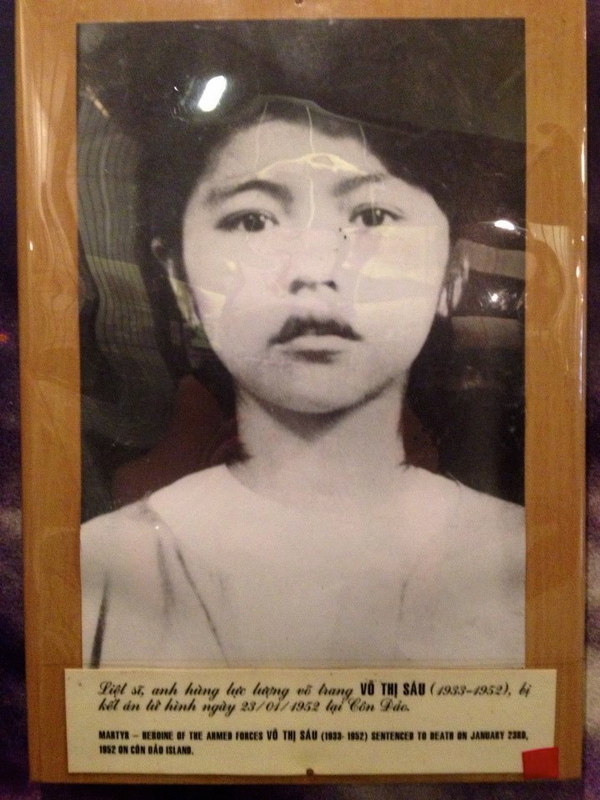 She was sent to 3 different prisons but was finally executed at 19 years of age. She is not only remembered here as a revolutionary but also as an ancestral spirit. The street this museum is on is named for her. 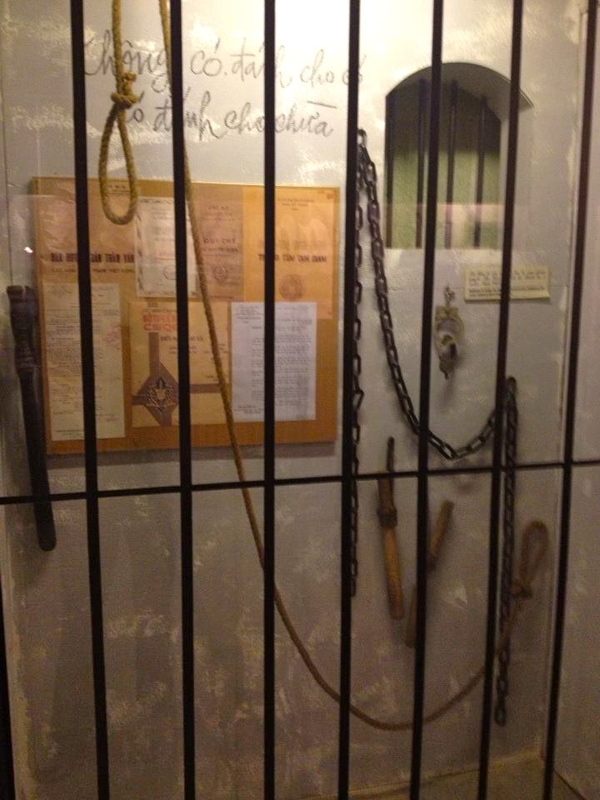 I really think this museum is underrated. Everyone tourist goes to the "other" one but this one is definitely worth a look. I think to begin to really understand this country and its culture, a great place to start is to understand its women. I left feeling sad, proud and highly impressed. I have the utmost respect for the women of this country, both in the past and the ones of today. 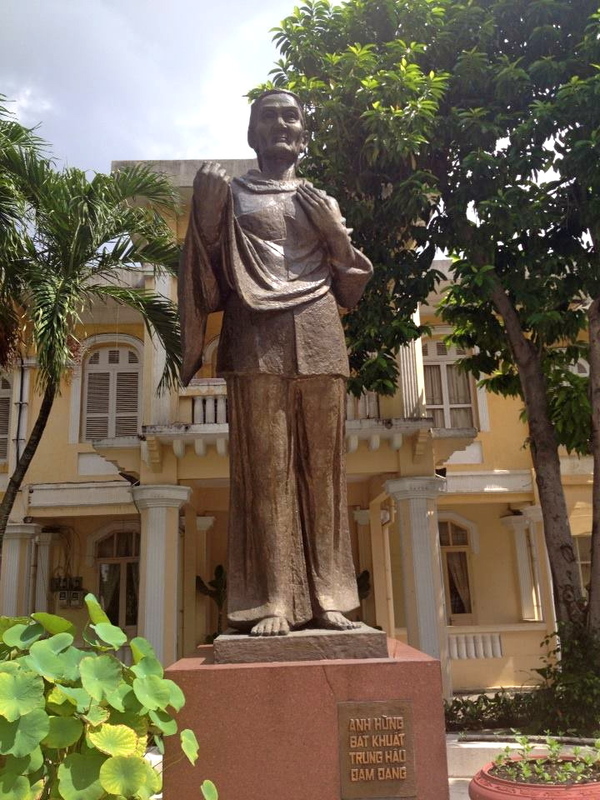 They have had such an influence on making Vietnam what is it today and surely this shall continue into tomorrow as Vietnam grows into its potential. Dani- I am going to miss your blog SO much. I hope the cold winter weather in Melbourne will not be too much of a shock to the system. I am excited to be heading back for our yearly winter holiday in Vietnam and will be trying out your recommendation for the silver jewellery place in HCMC, in just a few week's time. Mal you are so lovely! Thank you. I adore it when people take the time to comment. It really means a lot to me. I do this blog mainly for me and I'm so happy that others find it useful or interesting. No plans just yet. We would love another post but they are hard to come by in our line of work. We shall see how we go in a few years. When do you arrive? If its before the 28th drop me a line and either way, have a fabulous time. we'll be there 10th July- a little later this year (we usually get over there around mid-june) and a lot shorter than usual- we're off to the usa for a couple of months after Vietnam so just three weeks in vietnam this year. What a shame we will miss you! I'm not sure anyone will find a Moonee Ponds housewife even vaguely interesting unless I don a dress and re name myself Dame Edna. I guess to me it seems a little self righteous to think that my life in Aus might be remotely interesting. At least here I can offer a glimpse of something that is hopefully informative. Let me know if you need any shopping connections. I have my peeps that can look after you. Particularly at the Russian market. thanks so much for the great offer- may take you up on it- but probably not so much this year - we're flying AirAsia with only carry-on.. so shopping in the USA will win out big-time. Also, you had a friend who used to write an interesting blog- I think it was called Sommerville? whatever happened to them? I guess you're probably right- Housewife from Moonee Ponds may not make the same impact...but even just a top-up now and then so people know you're still alive and kicking and loving life. p.s. I'm going to have a few pairs of those giant silver hoops made for family in the USA - I'll tell her you sent me. I know a favorite of mine was The City That Never Sleeps In. Now THAT lady was a writer. Tabitha Carvan Went back to NSW with child. I'm sure they are parents by now and remember fondly their time in VN. I am still great friends with the sommervilles who continue their journey in South Africa. As you do. Shall tell Theresa to expect you. I'm sure the Somervilles must be loving South Africa - it's a great country - I spent 4 months there many year's ago. 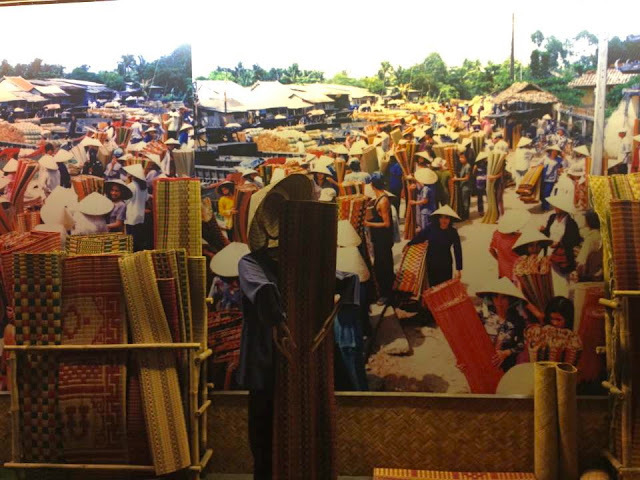 Do you think that once you get back to Melbourne you will have the same longing for Vietnam as so many of us do, to keep re-visiting it every year. 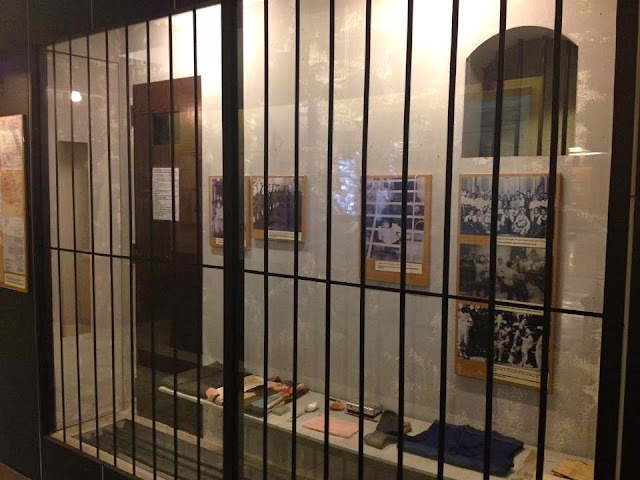 There are many of us regulars on the TA forum who just live for the annual visit. yes, please do tell Teresa - I'll go there on the 10th to order quite a bit of stuff to take to the rellies in LA. Mal we have done previous postings in East Timor and Cyprus but have yet to return. As amazing as a country is, so far, its just too hard. Saigon will not be MY town. The same people will not be there. It would feel a bit sad to try and re create the magic. The down side to this is that it makes the leaving so much more painful. Better to have loved and lost though right? I guess it's different because Vietnam was your home for a few years. there is just something about the people and the country which keeps drawing me back year after year (this year will be our 9th visit). I keep wondering when I will have had enough. I can understand not going back to a place you have lived in - you're right... going back is very hard. I've lived in 3 different countries in my life, and interestingly I haven't been back to either of the other two. yes, better to have loved and lost...what a great life Dani and what fabulous memories. Last year was my first time in New York and I was so taken with it I've dreamed of going back and in September we're spending a month there. definitely better to have loved and lost! The text means something like "indomitable, resourceful heroes defending the core". 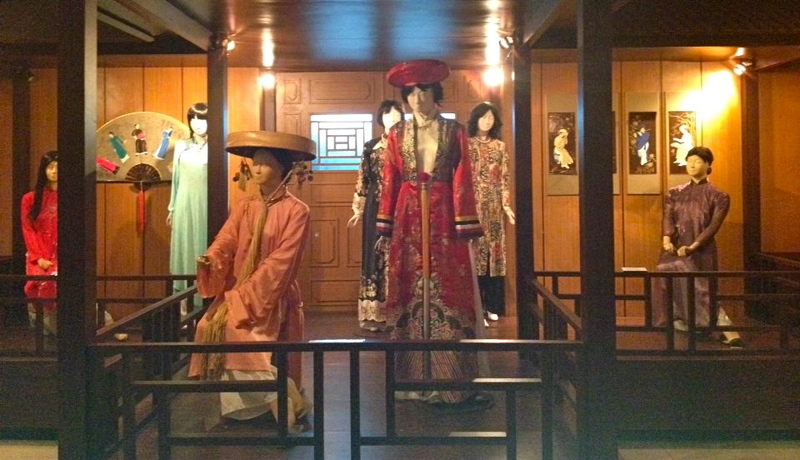 Fabulous museum, make me think behind the men are great women!!! Will miss your posts....enjoy being back in Melbourne. Thanks for commenting. It will be published after moderation. Need more info on living in Vietnam? XO Tours - Who says tours are for tourists! Lang Nuong Nam Bo Restaurant. Copyright © moggysmekongmadness. All Rights Reserved.. Picture Window theme. Theme images by Alitangi. Powered by Blogger.